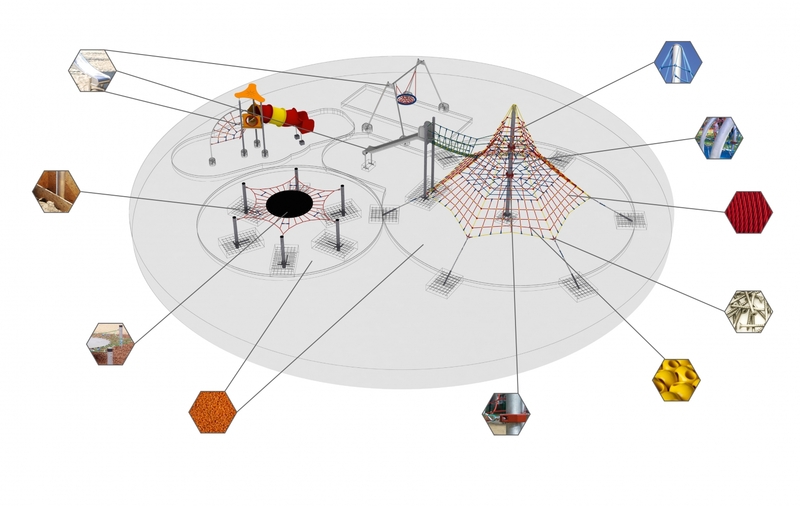 The rope we use is specially designed for the production of playgrounds. Its main features are the following: a friendly surface for children’s hands, no toxic properties of the used materials, resistance to UV rays, steel braid preventing vandals from cutting the rope and resistance of the used materials to atmospheric conditions (especially rust resistance, which is obtained by zinc plating of the steel strings). We use rope with diameters of 16 mm and 18 mm in the production of our devices. - The rope sheath is braided and not twisted. The polyamide sheath manufactured in this way has a higher abrasion resistance and thus prolongs the service life of the rope. - The steel strings are glued together and to the polyamide sheath. This solution makes the rope more concise, and there is no possibility for the sheath to displace against the steel strands. Summing up, the currently used rope has much better properties, which certainly will benefit the service life of the equipment. We use aluminium and plastic connectors in our projects. The natural properties of aluminium alloys and plastics of highest quality ensure high durability and strength. To ensure a maximum durability and to maintain a high aesthetic effect, we use only stainless steel rope thimbles and screws. This procedure guarantees a high quality of our products. The element that allows the installation of nets to the pole is a specially designed band clip. It is made of cast steel with a very high strength. The band clip is connected to an eyebolt, which is made of stainless steel. The main element of the structure is a hot-dip-galvanized steel pole. The material used for its production and a corrosion protection ensure long-term durability. The pole is secured at the top with a plastic cap. The elements of the sets that are not made of aluminium or stainless steel are protected by hot-dip galvanizing (minimum 100–200 microns), galvanizing (minimum 12 microns) and chlorinated rubber paints (primer + 2 layers). The foundations are made as reinforced concrete feet with the C25/30 (B30) high-strength concrete. The level of the foundation does not exceed 1 m.
- gravel with a fraction of 2–8 mm and thickness of 200–300 mm. The metal parts of the swings are made of stainless steel. This material has a very high resistance to the destructive influence of weather conditions, and mechanically damaging its corrosion coating is impossible—because it simply does not exist.